Tour guide speaking French, English and Arabic in Jordan, Syria and Saudi Arabia; Licensed by the Jordan Ministry of Tourism and Antiquities since 1994. Diploma in Business Administration, The Intermediate University College, Amman, Jordan, 1986. Professional Tour Guide since 1994. Independent researcher (along with academic studies) in Archaeology, Theology and History, Specialized in Biblical Geography. Certified Intercultural Teacher, 2007, by the Studienkreis fur Tourismus und Entwicklung. Organized and sponsored by the German Federal Ministry for Economic Cooperation and Development + Jordan Tourism Board. Graduate of the Jordan Evangelical Theological Seminary, 2002, Amman, Jordan. One day Symposium "Know Your Market to Grow Your Market"; 09/01/2011; organized by the USAID and the Jordan Tourism Board. The Seventh International Conference on Science and Technology in Archaeology and conservation; Speaker at the Tourism Session December 07-11, 2010, Petra, Jordan. The Tourism Development in the Petra Region Conference, February 17-18, 2010, Petra, Jordan. The Sixth International Conference on Science and Technology in Archaeology and Conservation. My presentation was on the unique Roman Emperor of Arab origin, Philip the Arab. December 09- 13, 2008, Rome, Italy. The Fifth International Conference on Science and Technology in Archaeology and Conservation. My two presentations were: (1) "Tour guides are potential rangers in the protection and safeguarding of our Cultural Heritage", and (2) "Tour guiding – a promising career in Tourism but at risk due to Terrorism", July 2007, Baetha University, Grenada, Spain. The Third International Conference on Science and Technology on Archaeology and Conservation. My presentation was on the "Five Christian Pilgrimage sites in Jordan", December 07-11, 2004, Dead Sea, Jordan. The 9th International Conference on the History and Archaeology of Jordan, May 23-27, 2004, Petra, Jordan. My presentation was on "Jordan, a Holy Land, and the case of Bethany Beyond the Jordan, Perea the wilderness". World Association for the Protection of Tangible and Intangible Cultural Heritage (WATCH). Leading Tourists, Archaeologists, Christian and Muslim Pilgrims, and University Students of different cultures, scientific and professional backgrounds to jointly explore, learn and appreciate the great legacy and different civilizations interpreted in the Tangible and Intangible Cultural Heritage of the people, culture and county of Jordan. Advocate for the best Jordan offers and the challenges it is overcoming through its History, Archaeology and Arabic Islamic Culture for the International Tourism Market. 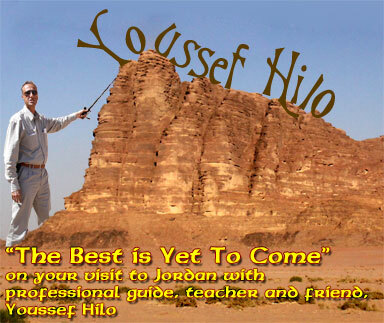 My goals and standards of working with tourists, visitors, consulting clients and colleagues is improving the ethics in the theory and practice of the Tour Guiding, in order to strengthen the important and crucial role tour guides play in the conservation and protection of Cultural Heritage in Jordan and worldwide.